Pictured, from left, 2019 Leesburg Town Council Vice-President Tom Moore and 2019 Council President Christina Archer. LEESBURG — At the Leesburg Town Council meeting held Monday, Jan. 14, Christina Archer was elected as the 2019 council president. Tom Moore will serve as the 2019 council vice-president. Leesburg Street Commissoner Craig Charlton stated that 132 feet of sidewalk was replaced in 2018 through the Leesburg Sidewalk Enhancement Program. Charlton told council members he has identified properties with dangerous sidewalks and will be sending letters to those property owners with information about the Sidewalk Enhancement Program. Although sidewalks are the responsibility of the homeowner, the program is in place to assist homeowners with sidewalk repair and helps cover the cost of concrete for the repairs. Council members approved a request by Derek Tenney of Tenney & Sons, Warsaw, for a storage facility near the main lift station to be used for storage of a backup pump, tools and other equipment. “I think that’s a wonderful idea,” Moore agreed. Council members suggested that Tenney obtain quotes for a storage facility. 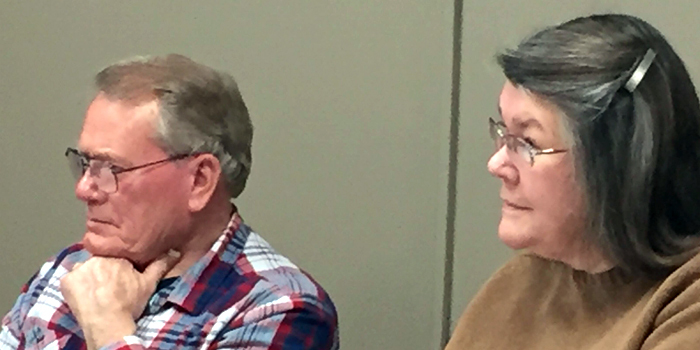 Regarding bypass valves for the main pumping station, Tenney informed council members that gate valves have been recommended and ordered, as opposed to quarter turn valves. “They won’t shut off,” Moore cautioned. Tenney said he has been assured that the valves they will be receiving will shut off. “The way they’re designed they have an extra drop-down that drops below the actual pipe itself,” said Tenney. Moore said he would be interested in looking at the new valves before they are installed. Regarding the new addition at the town hall building, Moore stated that at the current town hall building there is a drop box in the service door where some residents drop off their sewer bill payments. Moore stated the current plan does not have a dropbox. For an additional cost of $595, a similar box can be installed in the renovated building. Council members approved this amendment to the town hall plan. While on the subject of the town hall building, Moore said he had something to add. Moore said the town council board has been stashing away reserve funds each year. No parking on any street between 3-5 a.m.
No burning in the town of Leesburg. The next regular meeting will be held at 6:30 p.m. Monday, Feb. 11.